I get the sweetest comments when I share pictures of our living room. It took a few iterations to get where it is today, but I haven’t showed her off lately so I figured I’d gussy her up and give you a peek! (Apparently my living room is a woman…) My green couch is from Ikea and was a 40th birthday present from my husband, and I love it (her?). The blue couch was from a local consignment store and was maybe the first thing we bought for our first house! 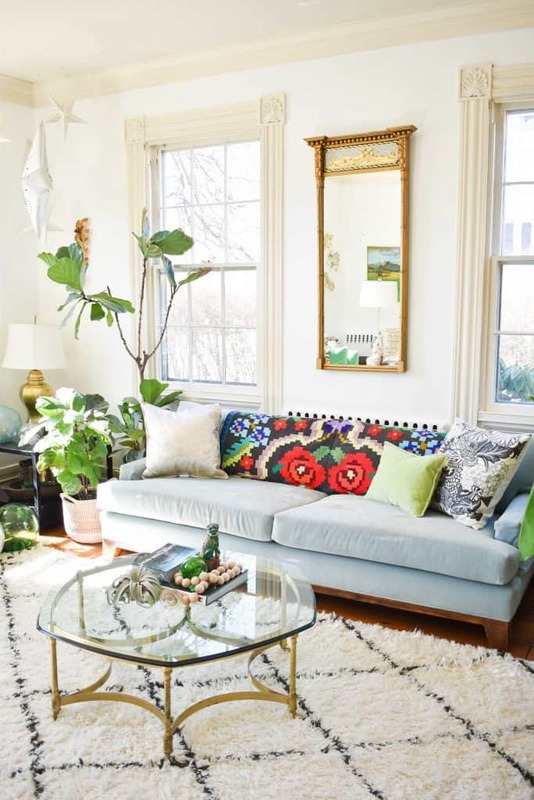 Truthfully, I love this space so I don’t make too many big changes, but I have made a few tweeks here and there and I added some spring details. Obviously, the two easiest ways to update a space are to update the pillows and the throw blankets. Last year, I made these buffalo check pillows put of dishtowels, but this year I was even lazier and I just brought down that amazing throw blanket (flea market!) that had been hanging in my new office! The pillows were borrowed from other parts of the house and then I changed up the coffee table styling a bit! With small kids, I can’t get *too* adventurous, but I love an air plant pretty much anywhere. I made those scrap wood vases last week and wanted to give them a little air time as well! Remember back in September when I posted about our new office and bought those benches and I was all “these were for the photo shoot and I’ll return them to Homegoods?” Yeah… about that. 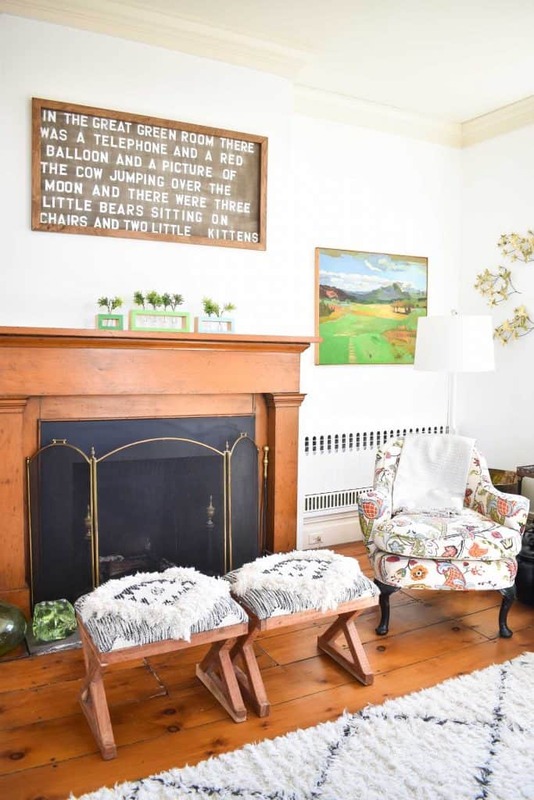 Awhile ago I moved that flea market floral print over the couch and brought in another flea market painting next to the mantel. 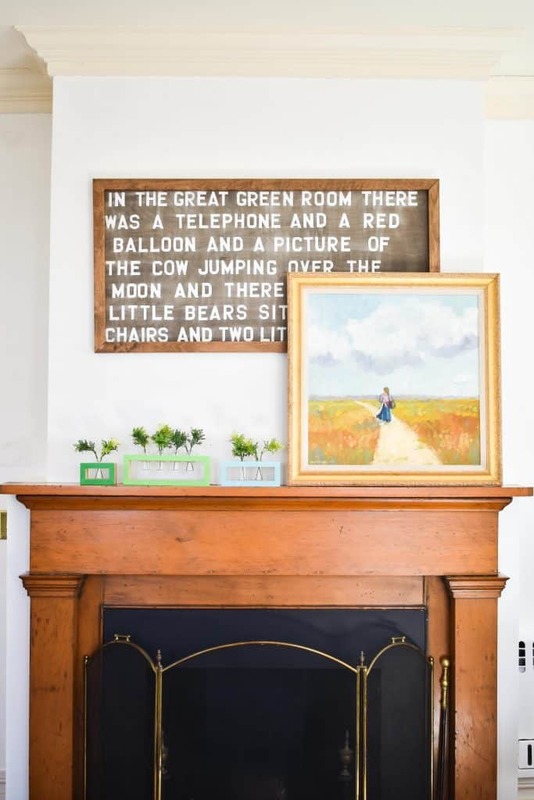 My stenciled Goodnight Moon art still sits over the mantel and I love that it gives me a bit of a neutral back drop for decorating the mantel! Like my graduation painting that I moved up there to make room for my DIY high end art that’s now in the foyer. 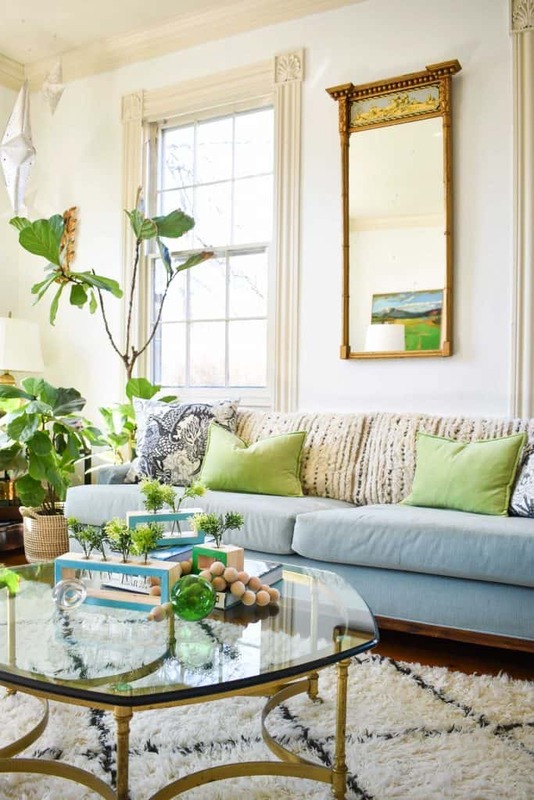 With some spaces, the smallest of changes can make the room feel ready for a new season. I didn’t do much in here, but it somehow feels… fresher. Brighter. What sort of changes (if any!) 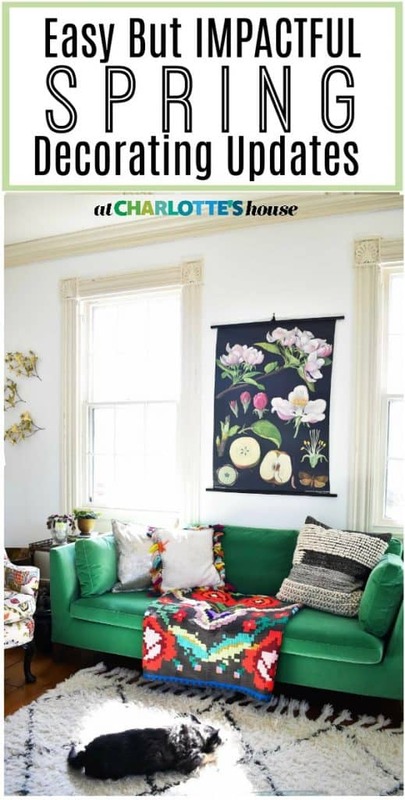 do you make around the house to get ready for spring? 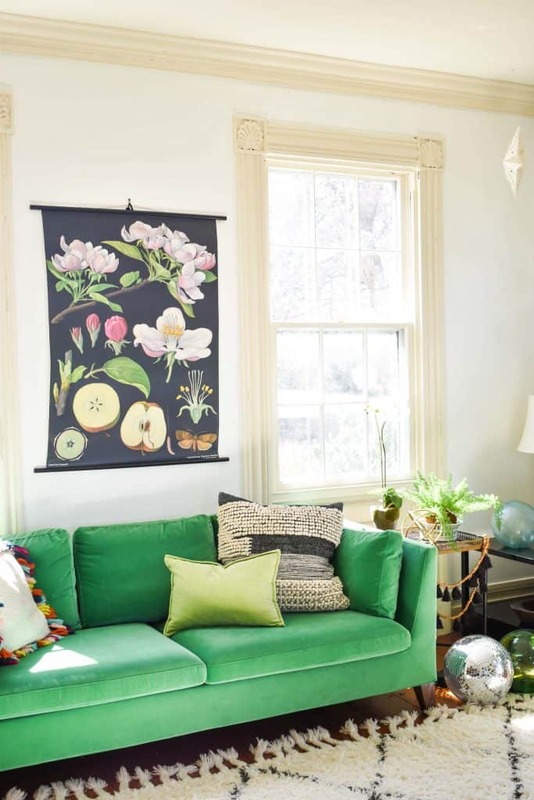 Love the throw on the green sofa, but looks cute, and softer on the other. Just depends on what look you’re going for! Love it all! Love them. I can’t decide. 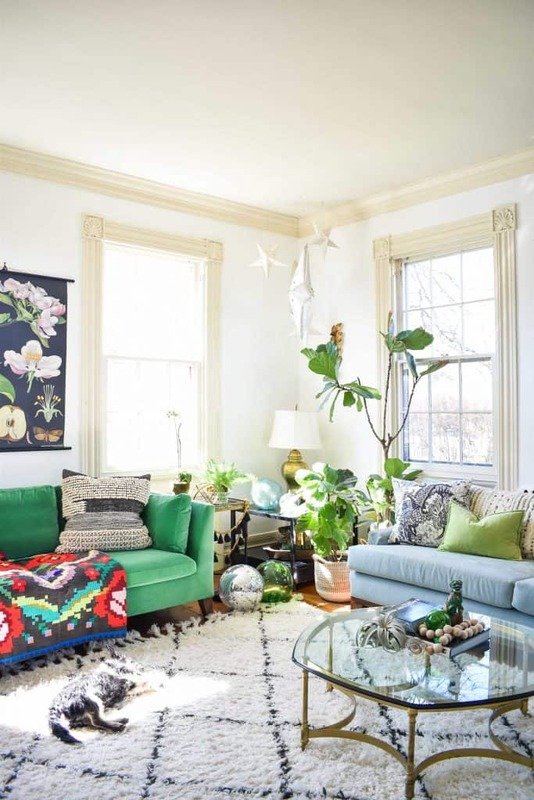 both rooms have an eclectic collection of items that make them both so perfect and curated. 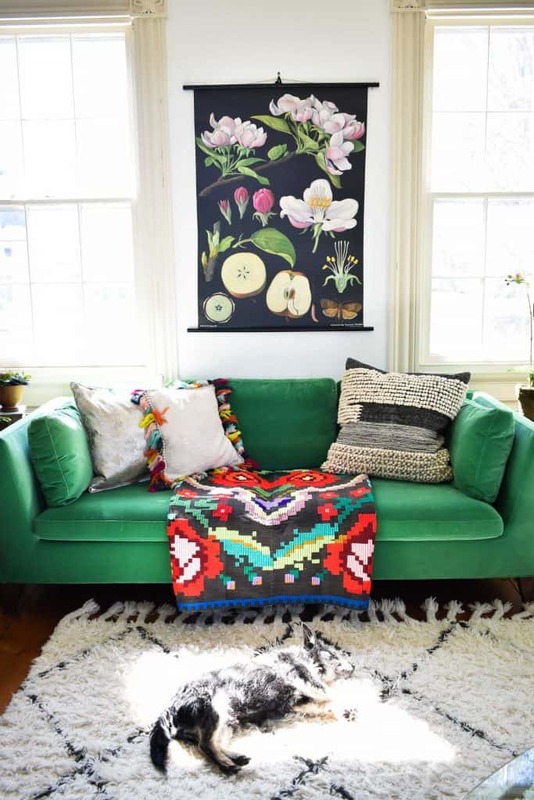 All of my life i have wanted a green velvet sofa! i was a little girl the first time i saw one and fell in love with it. i think of them as the piece of furniture that can be used in any decorating style and always look fabulous1 I love your room!